Zion Market Research has published a new report titled “Aerospace Composites Market by Resin (Epoxy, Phenolic, Polyester, Thermoplastics, Polyimides, Ceramic, and Metal Matrix), by Aircraft (Commercial Aircraft, Single Engine Piston, Helicopters, Military Aircraft, and Spacecraft), by Fiber Type (Carbon Fiber Composites, Ceramic Fiber Composites, Glass Fiber Composites, and Others), and by Application (Interior and Exterior): Global Industry Perspective, Comprehensive Analysis, and Forecast, 2017—2024”. 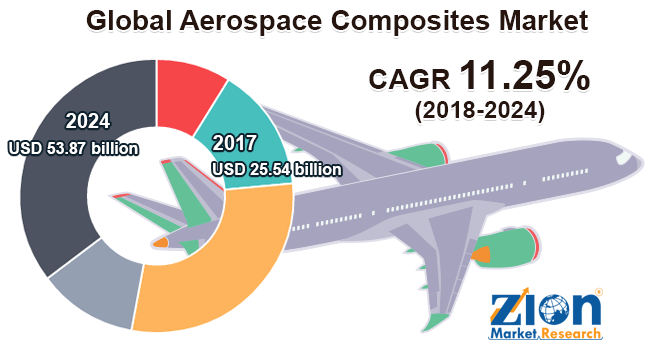 According to the report, the global aerospace composites market accounted for around USD 25.54 billion in 2017 and is expected to reach approximately USD 53.87 billion by 2024, growing at a CAGR of around 11.25% between 2018 and 2024. Aerospace industry uses a wide variety of composites. Aerospace composites allow weight reduction of components by decreasing the fuel consumption and help in increasing engine efficiency. These components have low durability and are lightweight, which makes them important for the aerospace industry. Airlines choose new airplanes to replace their old aircraft. The global aerospace composites market is majorly driven by increased air traffic and the availability of several low-cost carriers in developing regions, such as the Asia Pacific and Latin America, to make air travel more affordable for people. In addition, substantial growth of military and commercial aircrafts is expected to fuel the aerospace composites market in the future. However, the lack of standardization in manufacturing technologies might hamper this market in the upcoming years. Furthermore, the increase in the number of aircraft deliveries worldwide is likely to open alluring opportunities for the market players. Based on resin, the aerospace composites market is classified into epoxy, phenolic, polyester, thermoplastics, polyimides, ceramic, and metal matrix. Thermoplastics held the largest share in terms of value and volume in 2017, due to the increased resins usage to manufacture interiors of aircraft parts. Commercial aircraft, single engine piston, helicopters, military aircraft, and spacecraft form this market’s aircraft segment. Commercial aircrafts dominated the aerospace composites market in 2017 and are expected to dominate over the projected years as well. This can be attributed to the increased use of carbon fiber in commercial aircrafts. Additionally, the increase in affordability of flights has resulted in the rise in the number of people traveling by flights in the past years. The growth in the overall passengers is likely to fuel this market segment in the future. By fiber type, the market is classified into carbon fiber composites, ceramic fiber composites, glass fiber composites, and others. Carbon fibers are anticipated to dominate the aerospace composites market during the projected years, owing to the high product demand by commercial airlines for external structural operations. Interior and exterior comprise the application segment of the aerospace composites market. Exterior applications contributed a higher revenue share in 2017, owing to the frequent usage of composites in exterior aerospace structural applications. This can be due to their high strength and lightweightness. By region, North America held the largest share in the aerospace composites market in 2017 globally, due to the increased consumption of composites for interior and exterior parts in military and commercial aircrafts. Europe is expected to witness noticeable growth in the upcoming years, owing to the high composites materials’ demand in the manufacturing of high-speed trains. The Asia Pacific market is estimated to be the fastest growing over the forecast time period, due to increased air passenger traffic. Some key players of the aerospace composites market are Solvay Group, Royal Tencate N.V., Hexcel Corp., Toray Industries, Inc., Teijin Limited, SGL Group—The Carbon Company, Materion Corporation, Owens Corning, Mitsubishi Rayon Co. Ltd., Gurit, General Electric, Rolls Royce, Honeywell International, Advanced Composites, Kineco-Kaman, Nippon Graphite Fiber, Quantum Composites, Hyosung, Hexion, Renegade Materials Corporation, and E. I. Du Pont Nemours & Co., among others.